The scientist is independent of cruises with research vessels into the field. The effort for the experimental set-up is smaller. The environmental parameters can be varied in a wide range, enabling systematic investigations in a wide area. The experiment can be monitored and controlled in real-time. 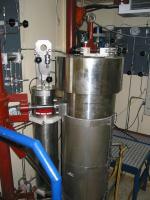 The solution and dissolution of methane, carbon dioxide and the appropriate gas hydrates (see photo: artificial generated gas hydrate inside a pressure laboratory) can be investigated experimentally inside a pressure laboratory. The impact of gas hydrate dissolution on the stability of the sediment at the continental slope, which may trigger submarine slides and slumps and subsequently tsunamis, can be quantified. The permeability of the seabed for pore water and gas from greater depth is a relevant parameter which affects in-situ measurements at the sea floor. It can be determined for natural cores, transferred decompression-free into a pressure laboratory. A pressure laboratory is well suited to generate the thermodynamic environmental parameters for maintaining deep-sea ecological systems, as found in gas hydrate environments. It will help quantifying the biogenic turnover rates of organic material by symbiotic living consortiae of archae and bacteria, which convert the methane to carbon dioxide and biomass by anaerobic oxidation. The influence of pressure, temperature and other environmental parameters on such biogenic processes can be determined as well. 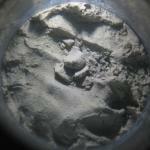 Special modules may be employed to explore the core fluid of black and white smokers and mud volcanos. Pressure laboratories can be designed to accept decompression-free fluid and (solid) sediment samples, which have been fetched and transferred under pressure from deep-sea. Such transfers can be executed while running experiments, and it is possible to extract samples under pressure from inside too. A pressure laboratory may be mounted stationary onshore, mobile on a vessel, or for mobile on- and offshore operation in a laboratory container. 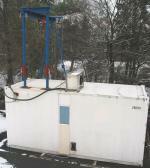 The photos on this site represent the pressure laboratory DL2, which was built in context of BMBF-project OMEGA by Dipl.-Ing. 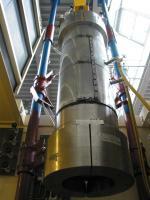 Holger Steffen, now acting as director of aar-naval ltd. At this time, the laboratory is working at the IFM GEOMAR in Kiel for the follow-up project COMET-GRAL, which deals with gas hydrates and the EU-funded project CARBOOCEAN, which deals with carbon dioxide sequestration. A pressure laboratory consists of a main pressure vessel and one or more supporting vessels. Inside the main pressure vessel, the experimentation is taking place; the supporting vessels contain fluid, which can be substituted into the main pressure vessel isobaric to influence the chemical and thermodynamic state (e.g. salinity, oxygen content, methane content, carbon dioxide content). The pressure vessels are built of titan or stainless steel (volume up to approx. 150 l, max. 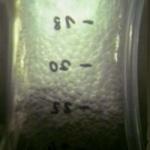 operating pressure 63 MPa, photo right above) or of glass (volume up to 25 l, max. operating pressure 1 MPa, under construction at this time, figure right) and are equipped with quick-release fasteners for easy access. In general, they have the legal status as a plant which needs to be supervised by the government and are certified by the German TÜV or the German Lloyd, furthermore a declaration of conformity in compliance with the EU-directive EG 97-23 will be issued. The pressure laboratory must be operated by a mechanician if reaching a certain extent. Visual access to the internal space is enabled by sight glasses (right photo: look onto the sediment surface of a core with a diameter of 100 mm, 700 mm below the sight glass). Additionally, it is possible to position miniature TV cameras. Electrical connection is realized by standard underwater connectors. Ports with a diameter up to 110 mm clearance can be operated under pressure and allow coupling additional tools to the laboratory. After pressure equalisation, the tools can execute special tasks inside the laboratory or extract sub samples while running experiments. 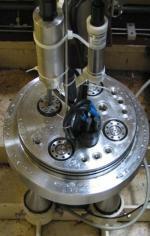 The ports also allow transferring big sediment cores decompression-free into or out of the laboratory. Partially, the ports are designed to be used for multi-purpose. Most times, the deep-sea environment is generated inside a special experimental set-up made of synthetic material (POM, PMMA) and stainless steel. The pressure vessel is equipped inside with several attachment points for this aim. The experimental setup itself may be composed for a special scientific task by linking several modules responsible for different functionalities. A particular module is needed for the generation of the desired hydrodynamics. 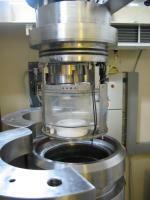 For such aims, the laboratory is providing a small pump and a facility for driving a stirrer. The peripheral zone comprises nearly all devices essential for efficient and safe handling of the pressure vessels. Particularly when the laboratory is mounted for the offshore operation inside a sea container, such cranes and guidance devices must comply with increased demands. In general, such a laboratory container will be certified by the German Lloyd. Also occasional changes of onshore location are facilitated by assembly into a laboratory container. It makes sense to provide the container with some basic equipment of a chemical laboratory. Self-evidently it is possible to mount the pressure laboratory stationary inside a building. Further peripheral equipments are the devices for generating the hydraulic pressure, the hydraulic circuitry, the cooling- and heating devices. The environmental main deep-sea parameters are computer-controlled. For investigation of in-stationary events, which occur when bubbles are rising or sediment is sinking in the water column or as a result of tides, the wished in-stationary environmental qualities can be pre-saved in a file or be defined by an analytical function. For operation, the surrounding infrastructure should ideally comprise three phase current, fresh and waste water and pressurised air.